Horseware® Interchangeable Liner - Clearance! Keeping your horse turned out appropriately for your climate will be easy. This breathable liner quickly and easily attaches to selected Rambo®, Rhino® and Amigo® Blankets. The Horseware® Liner is available in 100g or 200g of thermobonded fiberfill. All you need is Horseware® liners to have up to 5 blankets in 1. The Horseware® Liner utilizes VELCRO® brand and snap closures to allow you to attach the liner to the outer shell without extra bulky straps. The inner liner and outer shell operate as one unit. No more shifted and disheveled under blankets. The Horseware® Liner has a single front strap and no surcingles. Very easy to use! 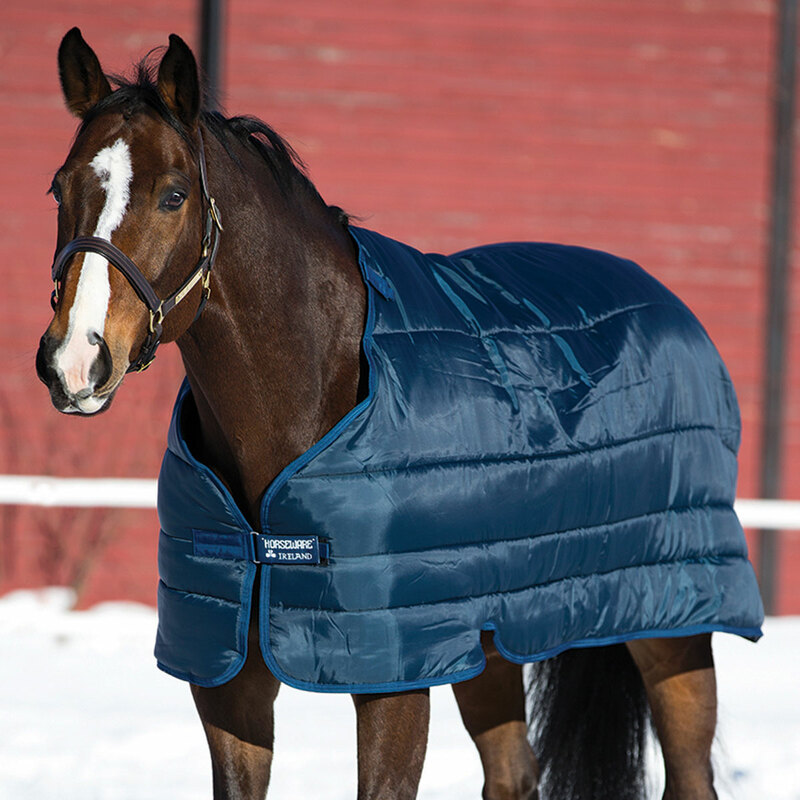 The Horseware Interchangeable Liner works with all Horseware blankets except those with Wug necks, Rambo Plus, Rambo The Original, Mio or Amigo Hero 6. Horseware® Interchangeable Liner - Clearance! is rated 4.6 out of 5 by 12. Rated 4 out of 5 by Riding June from Horseware liner Handy this is a nice light liner one can use with a sheet to make it a blanket or beef up a blanket for a very cold night, I have used it with a sheet and it worked fine, it would be nicer if it had a side fastener to affix it to the top sheet better not just at the back end. Rated 4 out of 5 by chestnutlane from so far so good I haven't had this liner very long but it seems like it will do the job. I have 2 different blankets that i have used it with, and no shifting or any other problems. It doesn't seem very rip-proof but time will tell if that will be an issue or not. Rated 5 out of 5 by SusaninMI from Great Value / Great liner! I always feel bad putting on two (or more) heavy blankets on my horse to keep him warm after clipping. This blanket liner did the trick! Perfect added warmth without the added weight. I bought both the 100 gram and 200 gram and use them both depending on our ever changing Midwest weather. Rated 5 out of 5 by TooMuchHorseToHandle from Great Blanket Liner! This blanket liner is everything it advertises! It stays in place well despite my horses's constant playing in his paddock. I was skeptical about the shoulder and tail cords being the only attachment points for this liner, but so far (in the last 2 weeks since I began using the liner) it has not slipped at all. It is a nice way to add a little warmth to the Rambo series blankets without spending the big bucks to buy another blanket - great for the variable winter weather in the midwest states! Rated 5 out of 5 by UKMOM from Great Quality The Rambo/Horseware products are excellent and well worth the money. The liner system is a great idea. Very good quality, fit, and easy to put on your horse. Rated 4 out of 5 by ThePopper from Very good liner I love liners, they are easy to use and stretch the horse wardrobe. Horse ware makes a really nice liner. My only negative comment would be that I'd prefer a better pair of snaps at the back, these are plastic and hard to use. However, I know they have an advantage over a metal snap in that they can't hurt your horse when you toss the liner on. Also I'd like to see a fabric that is stronger and more durable. Rated 5 out of 5 by MaryofMI from Recent Purchase - So Far So Good! Recently purchased this item so can't speak to durability yet ... and it's velcro loops are an inch or 2 off from the metal clasps on the neck of my elderly medium weight Amigo blanket, but it is great to have a liner to add or remove instead of having to invest in several weights of blankets! Rated 5 out of 5 by RobbiMum from Nice system We get huge temperature swings in the winter from -20C (0F) to 15C (60F) sometimes within a matter of 24 hrs. It is a challenge to blanket. This is a nice system that allows me to keep a minimum of blankets at the barn while covering all the bases. I have the Amigo sheet plus a 100g and 200g liner and they really do the trick. Easy to insert and remove, the liners are very light and easy to wash at home. The waterproof sheet has so far remained waterproof despite a number of drenchings. Only drawback was the lack of legstraps on the outer blanket. I had those added myself and now it's my perfect blanketing system! One thing to note is due to the layering effect the blankets seem to run slightly warmer than you would expect for the grams indicated. Rated 4 out of 5 by PeggyDay from Horseware Liner System When combined with compatible Horseware blankets this liner is great for turn out. The liner fits well under a like-sized blanket and stays in place if attached property to the blanket. But this liner cannot be used solo as a cooler. It provides extra warmth without the extra bulk/straps (or slippage) of layering with a cooler. Liner washes easily in my machine without having to wash my turnout blanket which increases life of my turnout and washing machine. Finally, you can purchase different weights to increase the temperature range of one turnout blanket. I have not had it long enough to comment on durability. Cons: A little tricky if someone else is blanketing your horse (especially when combined with a neck cover) as some of the liner attachments are near neck cover attachements and ALL liner attachments need to be secure for liner to stay safely in place. Liking whole system so far! Rated 4 out of 5 by Coldweatherrider from Great Product I love this product because I live in such a cold climate that I need as much warmth for my horse as possible. It has gotten to -20˚ within the last couple of weeks and because of this liner I was reassured that my horse wouldn't freeze. Unfortunately it isn't very durable with my horse who LOVES to roll and buck when he is turned out. I had my first liner for a year and with my old horse it stayed put but with my new horse it didn't necessarily last through a 5 year olds energy. But I would definitely recommend this to anyone who is looking for an extra layer to keep their horse warm during the cold winter months.